Since my last post, there have been a number of changes to the painting. 5.) Rocks painted and a far left portion of rocks made into tundra. ﻿This is a commission for one of my local collectors. They've now seen it and it is just what they were hoping for. Tomorrow we will meet at Pacific Flyway Gallery in Spokane Valley and choose a frame together. We haven't decided on a title but maybe one will come to us. Any ideas? I've worked my way from top to bottom. There are more details I will add after I work on the foreground rocks. The middle of the painting needs a greater feeling of "benches" (longer flat areas.) Maybe I should tone down the green near the muskox. I certainly want to add a more rocky feeling near the top of the ridge. Yes, lots more to do. 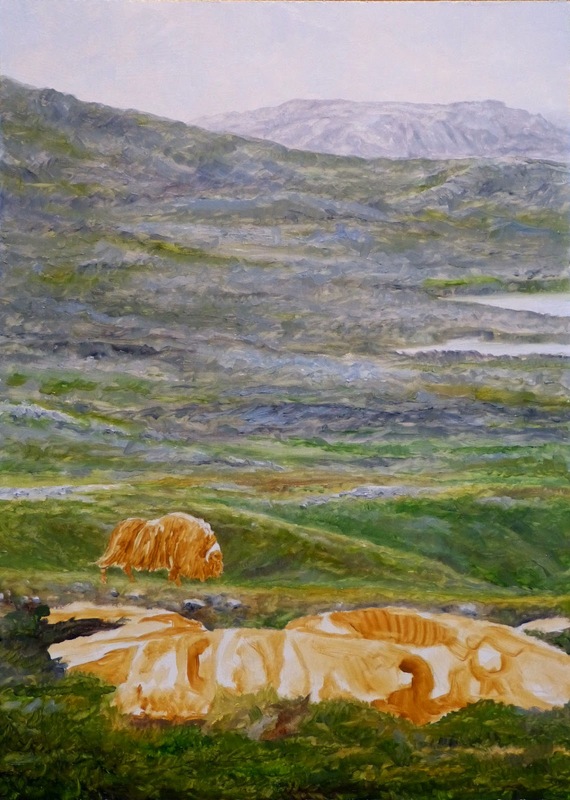 Many of my paintings are all about the animal. Here the focus is on the landscape. I wanted to portray the vastness of Greenland and a vertical composition seemed to fit the bill. 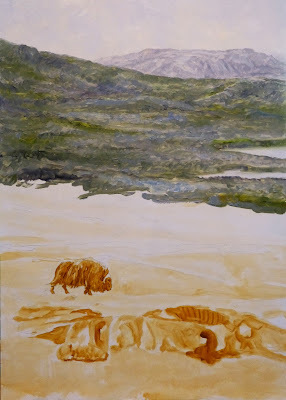 Using my muskox reference from above the Arctic Circle in Alaska, I am able to use the muskox for scale. 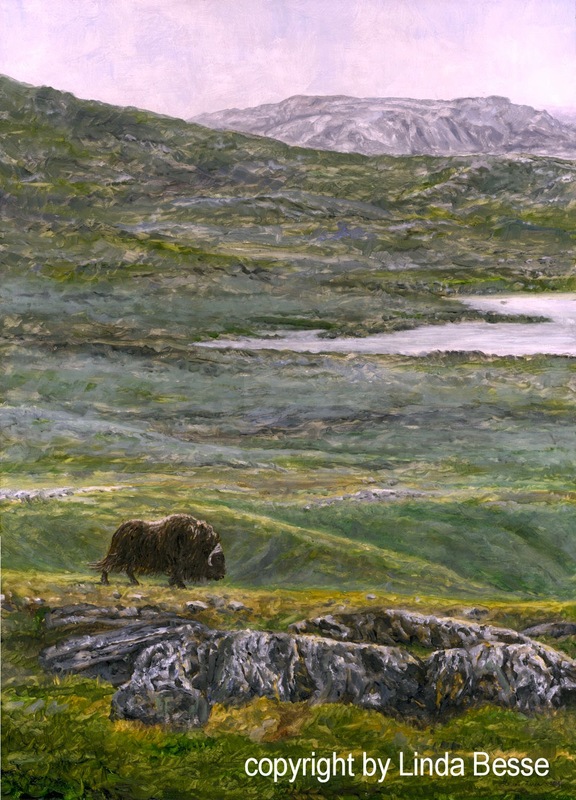 My plan is to paint the landscape loosely at this stage, then the foreground shield rocks, then the muskox. Once everything is in place, I'll go back through the entire painting and tighten up various areas to pull the painting together. 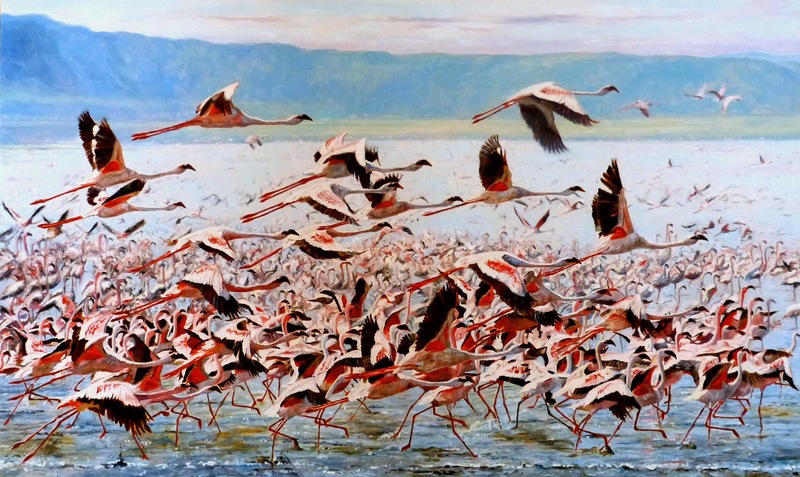 The painters, sculptors, and carvers who exhibit and sell are not only some of the best for their wildlife and landscapes pieces, they are a fun group of artists. We spend time each evening after the show to chat, eat, and play games. No wonder the waiting list for the show is long. Not only does the show generate more than 1/2 million in sales from less than 60 artists, but the show commission goes to a wildlife monument for Tulsa and to area conservation projects. The directors, their spouses, and numerous volunteers take no money for all their long, hard work in putting on the show. My heartfelt thanks to the Natureworks family. This was my 13th year exhibiting at the show and I had the honor of winning Best of Show - 2D for my painting Flight. In this group of artists, wow. Original oil 30" X 52"
I could probably go to everyone's booth and find something I loved. It is that kind of show. With my traveling done for a while, I am looking forward to a more relaxed time at the easel. Stay tuned for an "easel-trip" to Greenland.